Samsung already pushed the Android 8.0 Oreo update for some of its latest smartphones of 2017 under the beta program. With the rumors of Galaxy S9, which will be revealed at the MWC 2018, the manufacturer is once again in the news with the next Oreo Beta 6 update. The OTA update is now rolling out in South Korea, UK, US, India, and a bunch of other European and Asian countries. So if your device is already under the Samsung’s Oreo beta program, then download the latest version right away. The latest Galaxy S8 and S8 Plus Oreo Beta 6 for the Exynos variants come with firmware build number G950FXXU1ZRA5 and G955FXXU1ZRA5 holding the model numbers SM-G950F and SM-G955F. This is a great news as the US Snapdragon variants of S8 (SM-G950U) and S8 Plus (SM-G955U) will also receive the same update with Baseband versions G950UXXU1ZRA5 and G955UXXU1ZRA5. Moreover, in Asian countries like India, the update is termed as 3rd Beta because the update was pushed later in the region. How to download Android 8.0 Oreo Beta 6 for Samsung Galaxy S8 and S8+? Before we jump onto how to download the Oreo Beta 6 update for Samsung Gaalxy S8 and S8+, let us see what’s new with the update. We already know, the Oreo beta program in now live in most of the countries across the globe. At first, it was only limited to the United States, United Kingdom, and South Korea. Later in December, the company decided to push it onto countries like India, Poland, Germany, etc. This is the the 6th Beta Software Update with the latest Samsung Experience 9.0 upgrade. The Beta Software Update ZRA5 for Model numbers SM-G950F / SM-G955F brings the following bug fixes. It clearly suggest a bunch of performance improvements, fixed many app crashes, and battery optimizations as well. The annoying bugs of device being frozen and random reboots have been fixed while ending a call. Bixby now intrudes less while daily operations like while setting alarm. Most importantly, the Samsung Galaxy S8 and S8+ gets January 2018 Security Patch from Google. Bixby briefing does not work when setting alarm. After terminating a call, phone froze and restarted. Wrong display (text error) on Download Booster information. Game Tuner App crashes every time user restarts the device. Samsung Cloud crashes or freezes every time you delete old backups. Battery is draining due to unnecessary display activity. – Increase battery consumption because of acceleration sensor error. Phone froze and restarted after the other person hung up. 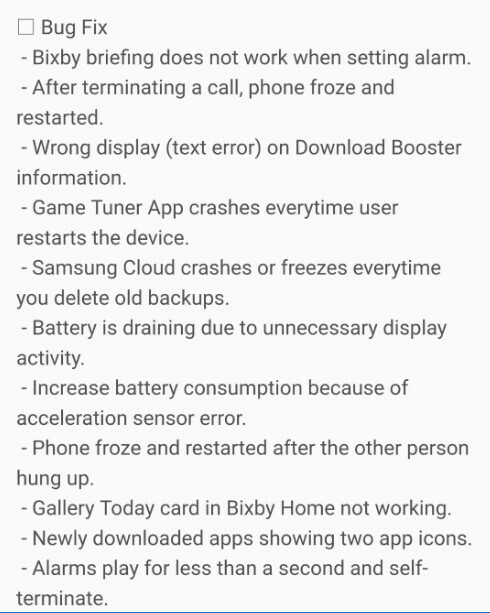 Gallery Today card in Bixby Home not working. Newly downloaded apps showing two app icons. Alarms play for less than a second and self-terminate. Samsung keyboard frequently keeps pressing digits twice. Linkedln app can now be removed. Face recognition is not working, and Iris recognition is slow. Smart View is not connecting. Message app force closes after hitting send. Device is set to vibration mode but notification sounds after a restart. Time and date is not visible on quick panel. WhatsApp icon badge showing as blank circle when it is set to ‘show numbers’. Email app constantly freezes and crashes every chance it gets. 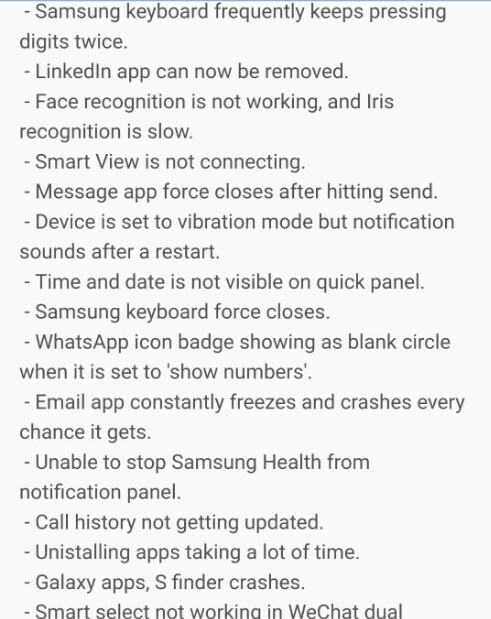 Unable to stop Samsung Health from notification panel. Call history not getting updated. – Uninstalling apps taking a lot of time. Galaxy apps, S finder crashes. Smart select not working in WeChat dual messenger. Secure folder is occasionally unable to use iris, and fingerprint unlock. Unable to set desktop and screen wallpaper. WeChat icon badge is not updated. Even though we see a lot of bug fixes and system improvements to the device, there are still some known issues. This includes the constantly rebooting while the dual app sound is set to ON in SoundAssistant app. So where to download the Beta 6 Oreo update? It is very easy to download the Oreo update for Galaxy S8 and S8+, especially when the update is rolling out across the globe. All you need to do is go to the Samsung Member’s app, go to the notice section and register for the beta program. Later, go to Settings app, System Updates, and download updates manually. You will be notified of any OTA within an hour or so. Read: Detailed tutorial on how to update S8 to Oreo.